Food Costs > How Much Do Mangoes Cost? How Much Do Mangoes Cost? One of the most common fruits available is the mango. A mango is a fleshy stone fruit and has numerous species, commonly found in tropical countries. In the United States, most grocery stores are going to sell mangos for $1.50 to $4 per mango or about $1.50 per pound. 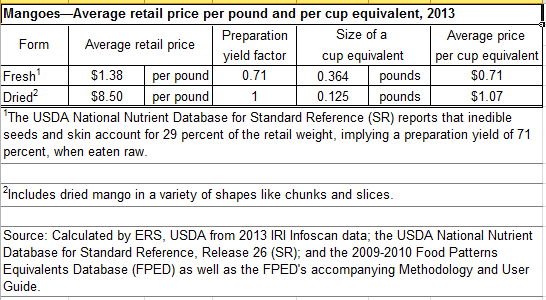 The cost will depend on the size, grocery store and geographical location. A mango in the summer in a tropical country is going to be cheaper, whereas a mango in a country such as Canada in the winter is going to cost much more. For instance, Amazon.com offers seven pounds of mangoes for about $35 or close to $5 per pound. Dried mangoes can cost closer to $7 to $9 per pound, depending on the time of year and store/market you purchase from. Amazon.com has a 20-ounce bag of Philippine Dried Mangoes that retail for close to $25. Mangoes purchased in bulk may come packaged in a netted bag. This bag is a way to transport the mangos as well as keep them fresh. Mangoes are high in Vitamin A, which is known to promote better vision. It’s also loaded with potassium. Six major varieties are available in the United States: the Ataulfo, Francis, Haden, Keitt, Kent and Tommy Atkins. Squeeze the mango gently to see if it offers any “give.” A ripe mango will slightly move while being squeezed. A mango is similar to peaches and avocados because as they grow old, they will become softer as they ripen. 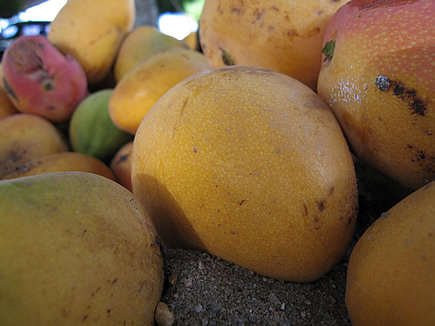 Ripe mangoes will often have a fruitier aroma on the stems. Always judge by the feel, not the color because the red color is often seen on a mango may not be an indicator because all species are different. A ripe mango will have a firm touch and a sweet aroma when up close. Try to avoid any that may have developed sap on its skin. As a habit, try to choose one by its aroma. To prepare a mango for storage, keep them at room temperature until it appears to be soft. Once soft, store in the refrigerator wrapped in a plastic wrap for up to five days. Tiny cut up pieces can also be frozen, but if left in the freezer, the skin can turn black, but the flesh will still be in good condition. They should last for up to six months if the pieces are properly sealed in an air-tight container. To properly cut a mango, you will first want to know where the seed is located. This is a seed that is generally flat and large. When cutting, you will want to cut from the stem to the bottom, cutting parallel to the seed. After this cut, you should have two sides of the mango open, exposing the inside. Take each of the two slices and develop a pattern to create smaller cubes. After the cubes have been formed, you can simply pop them out. For every pound, plan on getting close to two cups of diced fruit. Mangoes won’t ripen when stored below 50 degrees Fahrenheit. It’s best to store at 68 to 72 degrees Fahrenheit. Since mangos can spoil easily, they should be consumed immediately. Only purchase the amount necessary. Buy fresh mangoes since manufactured mangoes can cost more; additional costs to manufacture mangos will add to the total price of the product. When buying mangos, try to shop around on the internet or in your local market to compare prices. Comparing prices will enable you to choose the product that has the lowest price. Also, check local weekly ads for sales. Mango at Winco are 25 cents each! They taste so good and I have been having one a morning!